Rally is a relatively new sport that was designed with pet owners in mind. It combines elements of traditional obedience (like heeling, sits, and downs) with a little agility (like broad jumps, panel jumps and bar jumps). 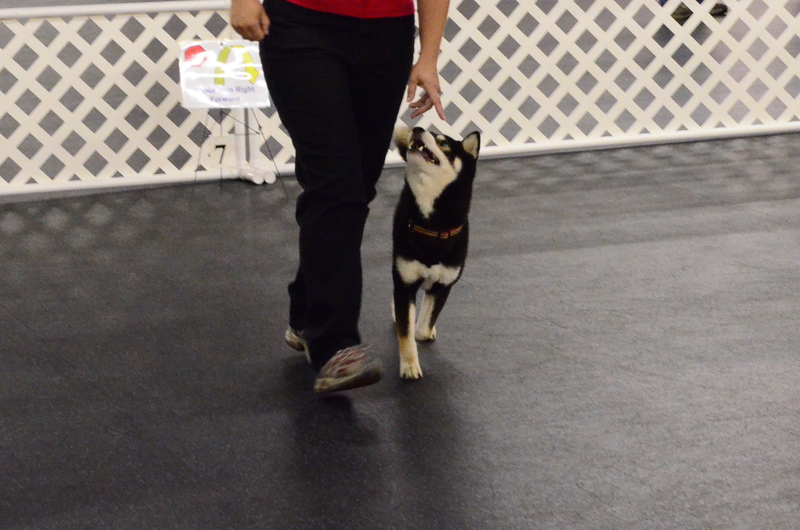 It is very much a team sport, requiring you and your Shiba to move through a course together based on the specific exercises that the judge has designed into the course. 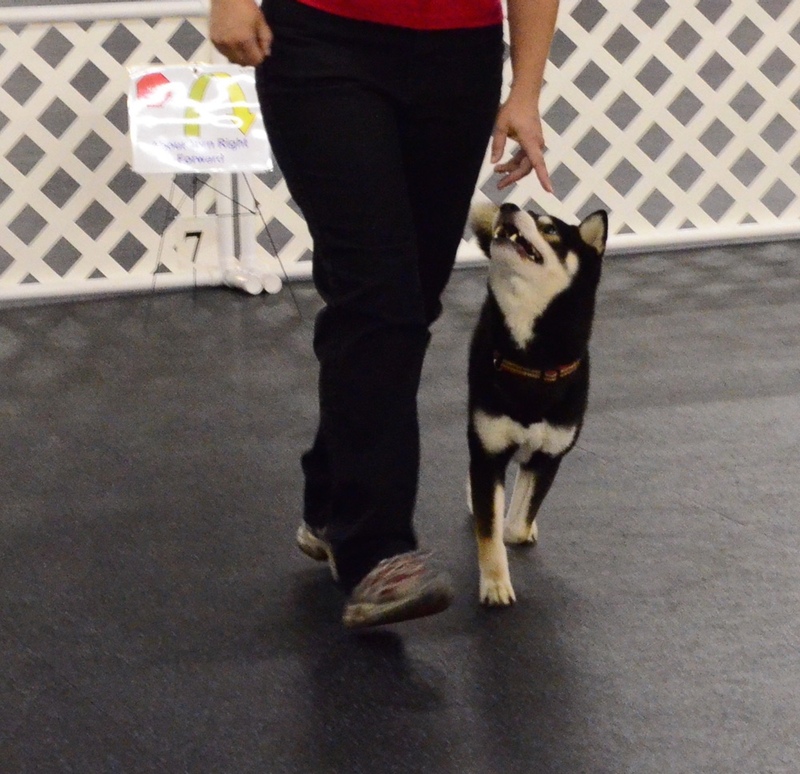 In Rally, unlike traditional obedience, you, as the handler, are allowed to praise your Shiba, repeat commands and use both hand and voice commands. 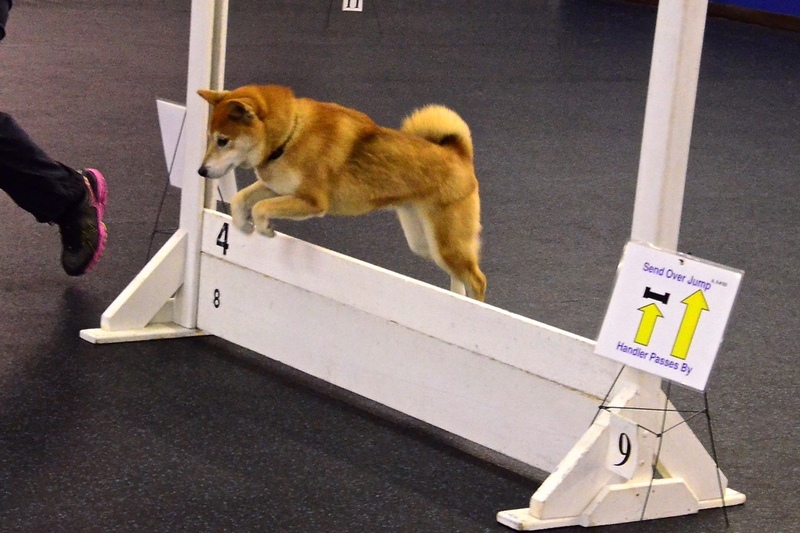 In comparison to agility, Rally does not require speed from either you or your Shiba, nor are there numerous obstacles that can require extensive training. 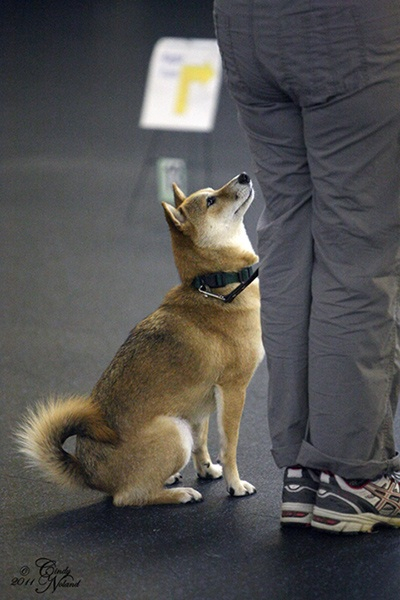 Rally is often a “next step” for a Shiba that has successfully completed the Canine Good Citizen (CGC) program because Rally exercises build on many of the skills that are part of the CGC program. 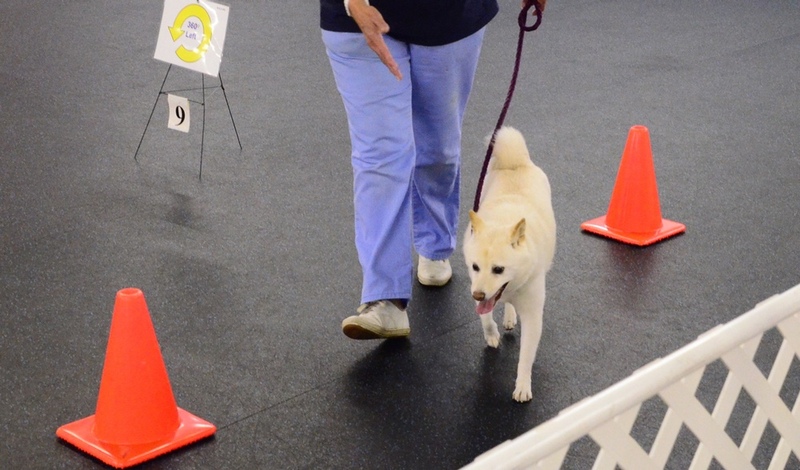 Rally is also sometimes a “first step” for a Shiba that will compete in Obedience or Agility because the skills learned in Rally provide a good foundation for working together as a team. Check out the Rally videos to watch Shibas compete in Rally. And take a look at the statistics on Shibas that have earned AKC titles in Rally. Rally is a team sport in which the the dog and handler complete a series of exercises in a course designed by the judge. 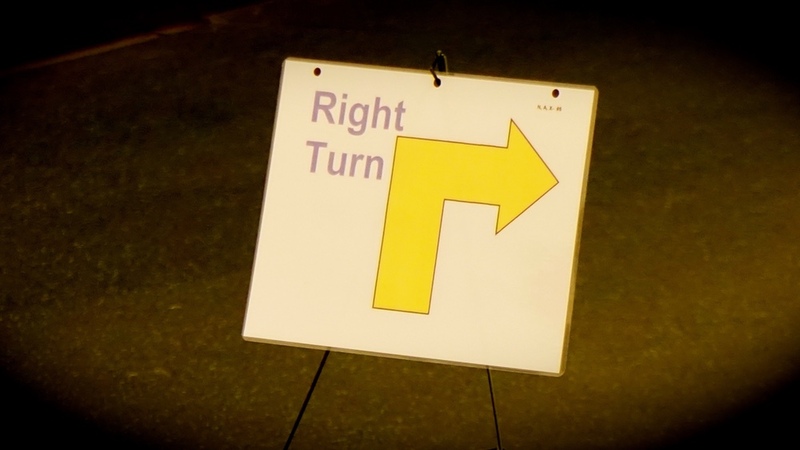 Exercises can be simple, such as a left turn, walking at a slow pace, a sit or a down. Or they can be difficult, such as moving backwards, jumping over a panel jump and returning to heel position, or a figure eight heeling pattern around two toys or food bowls that have been placed on the floor. At the novice level, the exercises are always performed on leash. More advanced dogs are expected to execute their maneuvers off leash. As you can imagine, there can be some funny moments when an off leash Shiba is asked to ignore a food bowl or toy and pay attention, instead, to a mere human being! There are several national organizations that sponsor Rally as a sport, including the AKC, the USDAA (currently known as World Cynosport Rally and previously known as APDT Rally) and the UKC. While there are differences in the exercises, scoring and titles, the fundamentals of the sport are very similar. The Rally team is expected to complete the course at a normal walking pace with the dog under control at the handler's left side. A perfect "heel position" is not required. Each exercise is noted by a sign that is placed on the floor. Exercises are completed in the sequence designated by the judge. Depending on the level of difficulty of the course, the course will include from 10 to 20 exercises. The handler is given a course map that identifies the exercises and an opportunity to walk through the course prior to performing the course with the handler’s canine partner. Title earners in AKC receive a certificate as well as the right to indicate their accomplishment by placing the title earned after their name. Since the sport was introduced by the AKC in 2004, over 125 shibas have earned their RN title while only slightly more than 10 shibas have earned their RAE. In addition, each year the AKC hosts a Rally National Championship event where the top Rally dogs in all breeds compete for the title AKC Rally National Champion of that year. Probably! AKC, UKC and World Cynosport all permit both purebred and mixed breed dogs to compete in Rally. They also require that the dog be at least 6 months of age and be registered with that organization. To enter an AKC Rally event, your Shiba should either be registered with the AKC or listed with the AKC’s Purebred Alternative Listing (PAL) program. Many dog trainers and dog clubs offer Rally classes. In your area, look for an experienced trainer who employs positive reinforcement techniques and who works well with different breeds. Also consider whether the trainer has earned titles in competitions with his or her own dogs. Ask to observe a class before signing up for a training course so that you can see, firsthand, how the trainer works with students and their dogs. You could also consider attending a Rally event to see what it is like. Some dog shows offer a wide variety of events, from conformation to obedience to rally to agility. At these large shows, many events may be occurring simultaneously, so make sure you know the ring number and time that Rally is being shown. Other dog shows are limited to specific sports, like Obedience and Rally. The AKC’s website offers an easy tool to look up events in your area. For information about Rally exercises and signs, see the Rally regulations for the AKC, World Cynosport Rally or UKC. For those with an iPhone or iPad, you can also download an App called "Pocket Rally Obedience" from Blue Ribbon Dogs that shows all Rally signs along with the instructions for performance. There are separate apps for AKC, UKC, and World Cynosport (APDT). For questions and tips on working with your Shiba in Rally, join the Shiba Sports Yahoo! Group.